First published in 1980 as an independent piece of short fiction, and part of Madeleine l'Engle's Austin Family series, The Anti-Muffins should really be considered as the "missing chapter" of the first book, Meet the Austins (left out of the published novel in 1960, or rather, it was deemed prudent by the publisher not to include it). 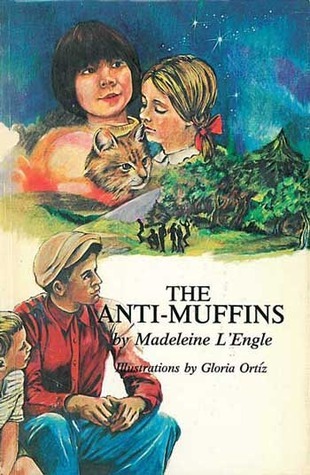 I am indeed pleased that since 1997, The Anti-Muffins chapter is generally included within the novel, within Meet the Austins (and remain both annoyed and really quite flabbergasted that Madeleine l'Engle was asked to remove the entire chapter, but considering the time period, and some of the issues presented, such the fighting John and Maggy engage in, and the fact that the Austin children create an actual club to promote ethnic diversity and protest general attitudes of to them unacceptable adult behaviours and attitudes, perhaps not all that surprising either). And I actually do NOT believe that you are reading only part of Meet the Austins if your copy of the novel indeed does not contain The Anti-Muffins. However, if this happens to be the case (and it generally will be the case with editions published prior to 1997), you should at least consider reading The Anti-Muffins separately (it is generally considered to be the fifth chapter), as The Anti-Muffins is both interesting in and of itself (and for its time rather majorly avant garde) and it certainly does tie up some rather loose ends, especially with regard to Maggy and her increasing level of acceptance by and in the Austin clan (as well as by their friends and acquaintances, the members of the anti-Muffin Club). my love of the austin family led me to interloan this book, a short story written for a younger audience than "meet the austins." chronologically it fits right after the events in that book.this was a reasonably entertaining, if slightly preachy and ridiculously outdated, little visit with the austin family. i'm amazed that a public library is still circulating this little number in the j section. it's part of a series called "The Education of the Public and the Public School: A Monograph Series of the UNITED CHURCH BOARD FOR HOMELAND MINISTRIES" and opens with a long and boring introduction explaining its inclusion in the series. just what all the kids want to read! This isn't even a novella - more a short story about the joys of non-conformity. If you've readMeet the Austins , more than half of this book is repetitive exposition. Still, not bad - if a little dated. Good short story with a great moral. I have read every Madeleine L'Engle novel and while I like some much better than others I enjoy all of them at least in part. This is not one of my favorite books by her but it is still quite good. Her writing style always engages me and I find at least one character in every one of her books that I can relate to in some way. This little gem isn't easy to come by, but it's worth looking for. It's part of the Austin family series, and is technically a children's book. If you're wondering what an antimuffin is, this is the book that will tell you. I was disappointed that this was just a chapter excerpted from one of her Austin Family books! This short piece is also told in another book in the series. Read it if you like the Austins. A really short story that goes to explain something that was mentioned in passing in a previous Austin series book.